If you watched the Duluth opener, you knew it was only a matter of time before he was going to win. Well, it happened sooner than later. "Qualifying first by sweeping both his heat races in convincing fashion, Tucker Hibbert was on a mission at the AMSOIL Championship Snocross Blackjack National today, catching and passing Duluth (Minn.) double winner Robbie Malinoski (AMSOIL/Ski-Doo) three laps into the 15-lap contest and pushing his sled on the treacherous track to a 23-second lead at the checkers." Good job buddy, way to dish it out !! Saturday nights start to finish win was just as impressive! !Way to go Tucker and the rest of team 68!!! Exciting! It's nice to see that Tucker is back to his old ways. Tucker is Cat's only chance of winning this year. I would say it's a pretty good chance,since he has already done it twice. Think Scott Smith should find a web site regarding racing goggles to determine which one is better, Scott or Smith. I'd probably choose Spy myself. I have full confidence in Logan, Thomsen and Kaufman finding their ways to the podium this year. Both sleds and riders look strong. Scott said what every fan of racing already knows, which is Tucker is Arctic Cat racing and will be the only Cat driver to win a pro final. Wow. The idea that people can't come to grip with the fact that the only hope Cat has at winning is Tucker Hibbert is astonishing. Based on what I saw from Bessemer, I'm not sure there's any other driver who will beat him, at least on a decent track. This year it's the same handful of guys as last year who look likely to win. However I also think that the rest of the Cat guys will do better overall than they did last year, with podiums being a strong possibility. This is what racing at the highest levels is almost always like. For instance, you could say that Ryan Dungey will be the only KTM rider to win in Supercross... that Nikky Hayden will be the only Ducati rider to win in MotoGP. Sometimes there is one team/brand that has a couple of "best" riders, but not too often. Tucker is a monster force (pun intended) among Team Arctic racing, but it's a huge exaggeration to suggest that he's the entire team (not to mention that it's also quite insulting). Well put John, he is an awesome competitor but did any of the other field have a father in their back pocket like Tucker does? 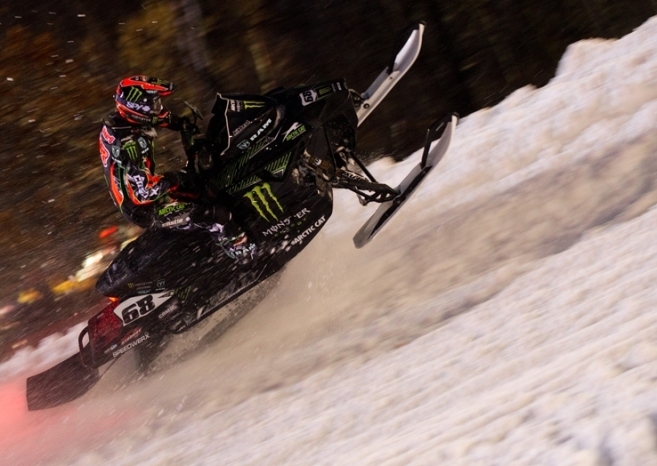 Kirk has been a force in Arctic Cat racing for decades either in developement,testing,racing, designing,etc. He is one of the best people the entire Cat team has, second to only maybe the great Roger Skime at this time. And guess what, they are both excellent role models for the sport and Arctic Cat. Edgar would be very proud, I just hope Cat can field a team to Win again at the Soo. ChefE: "Toonces! Watch outtttt! ""He devirs around, all over the town,Toonces the driving cat.""Toonces. The cat who could drive a car, just not very good. "I love it!